Liam Neeson returns to defend a family once again in this action packed thriller about eye-for-an-eye vengeance. Jimmy Conlon (Neeson) is a rundown assassin working for crime boss Shawn (Ed Harris) who, despite having distanced himself from his family, must defend his son after he kills Shawn’s son in defence. Shawn sets everything after Jimmy and his son Mike, from corrupt police and professional killers. While it is all fun and games to chuckle and say: “Gosh, how many times does Liam Neeson need to protect his family?” what with the three Taken films and now this, and the barrage of Neeson action films from The Grey to Non-Stop, it is kinda true. In the last five years he has made around six of these things. What drew me to see Run All Night (I have not watched the Taken sequels) was its 15 certificate. But, it does have a familiar vibe to it… which given what I have just told you, is detrimental to its success. It is altogether enjoyable however, at least it is a decent way to spend a couple of hours. 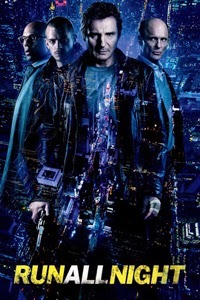 We get to see Neeson in another action movie but this time he starts burnt out, the laughing stock of his criminal buddies; his ever growing conscience of his dark past leaving him reluctant and timid. This I liked. Ed Harris, a favourite actor of mine, plays his old familiar character: a steely-eyed man of principle. Yet the early friendship with Neeson’s character is genuine and it is great to see these two powerhouse actors together. Even Joel Kinnaman does well here as Neeson’s begrudging son Mike, recouping a lot of credibility after the lacklustre turn as RoboCop2014. The action is excellent too with a great mid-point car chase, stealthy shoot-outs and brawls. The film is almost entirely taking place in one night (hence the title) and like all good action films, it is set around Christmas. I like my action movies at night. It takes on a very 1990s action vibe. But whether or not I was expecting more, perhaps my own mistake, but Run All Night didn’t feel as engaging as it could have been. For such a simple premise: Father kills other man’s son, other father wants revenge in kind, the story feels very compartmentalised. This strikes hardest when Harris hires a professional hitman to go after our heroes, this must be half way through the film, and feels like a sub plot thrown in for a longer runtime. Plus this guy is cartoonishly evil, with a monocular glowing green night-vision device and a red laser sight on his pistol, having half his face burnt off yet he shrugs it off like its nothing? I don’t know, it felt like a deviation from the real story: Harris and Neeson’s relationship, and while that does pay off really well I felt even more time dedicated to it would have gone a long way. That and less stock dialogue, like one of Harris’ first lines: “I’m a legitimate business man now”, or “You should have killed me when you had the chance”. It is a good movie, mostly for the car chase and all of the scenes with Harris and Neeson, both easily carrying the dialogue and story. A gritty, urban, night time chase.